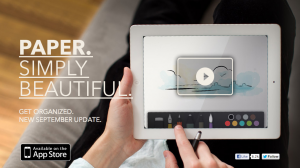 The award-winning iPad app for freeform writing, drawing and sketching called Paper has surpassed 3.3 million downloads with over 25 million pages created. Created by a team of developers at start–up FiftyThree including GraphConnect speaker Aseem Kishore, the app was recently chosen to be featured in demo iPads and at Apple retail stores. Aseem Kishore will be part of the panel “Lessons Learned: Startups and Graph Database Adoption” at GraphConnect. Read the full article here.